I was thrilled today to find that Tina of Yummy , Scrummy, Create blog had chosen me as one of the people to receive a trinket box to decorate: I can't wait to get it and make something (hopefully) nice. Tina has also made some gorgeous boxes to give plant gifts in so if you don't know her blog I really recommend it. I get the email updates so I don't miss a thing! 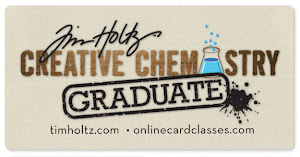 Well, if you've read the post below, you'll appreciate that I haven't felt very sociable lately although I have been keeping busy doing lots of decoupage cards. 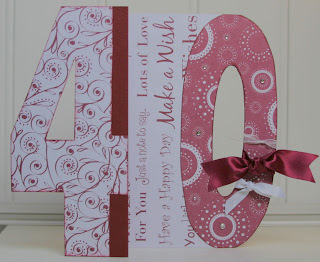 I also made this one for a friend's 40th (you'd never have guessed!) 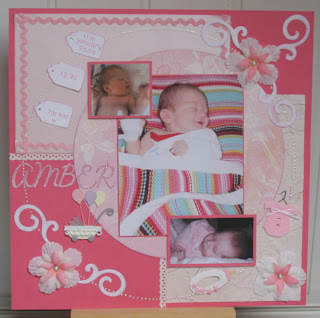 using the new Papermania 'The Big One' paper pack, Colorbox chalk ink, adhesive gems and some ribbon pieces. Hope you can see it's 3-fold and I wrote the greeting on the fold back part. There seems to be a lot of candy on offer at the moment: I haven't been hopping much but I subscribe to Claudia's blog, Pretty Pressings, and Magnolia have given her an incredible candy to offer which will be split for 6 lucky winners. One of the blogs I follow is Jennifer's Sweet Treats for the wonderful things she does with Cuttlebug embossing. She has reached 200000 hits so is celebrating with 3 prizes! Another I follow is Donalda who is also celebrating with candy. And I've discovered Zoe's blog which is lovely - like her style - and celebrating its blogoversary. Many of you, especially those that were on the Funky Fairy Design Team with me last year, know my niece, Terri, had been battling with leukeamia for 10 years. She lost the fight on Friday and slipped away peacefully at home, aged 16. 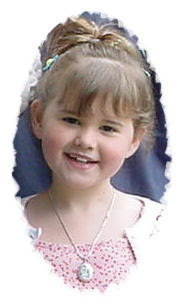 I will be sorting photos and scrapbooking lots over the next few months but here is one taken at my son's christening back in 2001 when she was doing well towards the end of the first 2 years of treatment and one taken last year after her bone marrow transplant. You can read more about the beautiful quilt here. When I saw her last month she still had it over her. 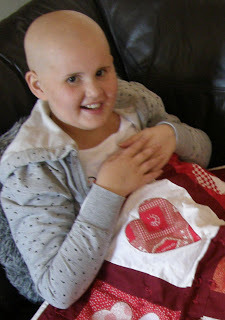 I'm grateful to Clare and the wonderful team supporting Quilts 4 Leukaemia for the comfort it gave her. Thanks for all the kind words we've received. It's been too long again! Soooo busy! Lots of cards but too little blogging! Special thanks to Annie for the nice comments yesterday which got me spurred to add some new stuff again! Not usually a scrapper on the full 12x12 scale but I created this page at the Tourc'h 2 Scrap group evening a few weeks ago: I scratched a photo and only replaced it yesterday. It follows a sketch (info and another example here) with so much detail on it: I hope it doesn't look too fussy. I really like how it's come out but the photo seems different: In fact I think that's one of the reasons I haven't blogged so much lately - I've been disappointed with the photos in comparison to the real thing. Anyhow, no prizes for guessing this is our granddaughter: The first pics from when she was in hospital: Three days in a baby unit hence all the tubes! Since had news from my husband's oldest: Second grandchild will be arriving in September!!! Used: Papermania card for backing, mats and the circle; pearlescent card from Diamond Card Craft, tags, which are inked with Brilliance 'Pearly Orchid', and flourishes from Debbie's die cuts; flowers from Imaginesce and Papermania, brads and gems also Papermania, Doodlebug rub-ons, 3D stickers from Jolee's and/or Dovecraft; Dylon 3D pearl paint; Cuttlebug 'Harmony' alphabet cut from same pearlescent card, inked with Brilliance and covered with holographic glitter glue; ric-rac, paper lace and textured paper from stash.